CARBONDALE, Ill. — High performance street machines, hot rods and trucks will be on display at the General Tire Street Machine Nationals, and students with Southern Illinois University Carbondale’s nationally recognized automotive technology program will be there to get a hands-on experience and immerse themselves in the atmosphere. The fervor and dedication that participants feel toward their machines will be evident and contagious, Michael Behrmann, Department of Automotive Technology chair, said. 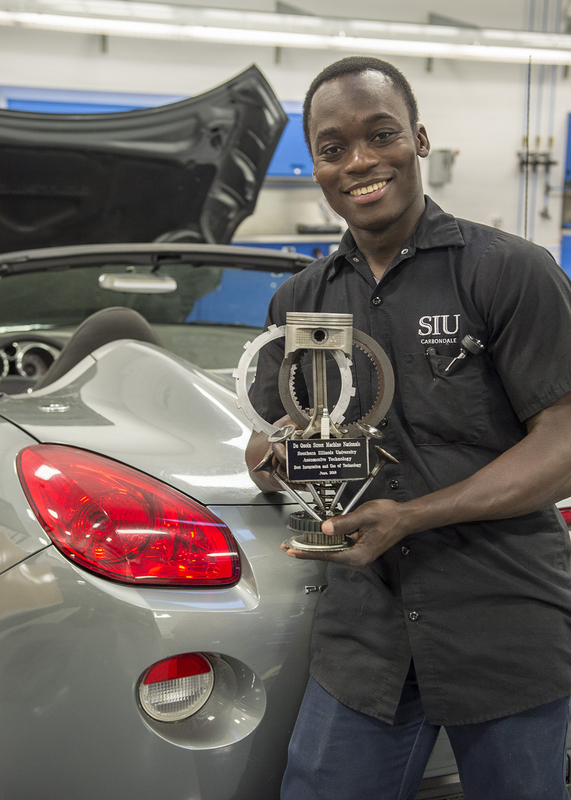 For a third year, SIU students will host a “Hot Rod Hospital,” where they lend a hand in making repairs or loan tools and equipment to event participants who need to make quick adjustments to their vehicles. The program offers opportunities for both hands-on experience and community engagement, Behrmann said. In the case of a parts breakdown, participants can go to a local auto parts store and get repair help from students. This is the sixth year students will develop, judge and present the “Best Integration and Use of Technology Award” since the three-day show returned to Southern Illinois and the Du Quoin State Fairgrounds in 2013. The award goes to the participant who judges believe integrates technology when building and fabricating different components on the vehicle. Power, performance and some of the nation’s leading muscle cars will be among the more than 2,500 vehicles featured at the 35th annual event. Organizers expect more than 24,000 people will visit the fairgrounds for the show which opens Friday. Each year, students assemble a judging team, develop a plan and put into action their processes to evaluate thousands of show vehicles over one weekend. Students from the College of Engineering will also participate this year. The trophy is a made out of a combination of engine and transmissions parts and features a piston, valves and several gears. Holly Pierre, a senior in automotive technology from Port Au Prince, Haiti, cannot wait to go to event on Sunday. There was not much opportunity to see classic modified high-performance cars in Haiti, he said. “It’s going to be my first time going there. I have not had chance before because I’m always busy. It will be very cool experience for me,” he said. Pierre, who will graduate in May 2019, wants to be a field service engineer when he graduates. Field service engineers help dealership technicians diagnose and fix vehicles brought in for repairs. About 20 students, including some who are returning to campus from summer internships, faculty and staff will be available during the weekend, Behrmann said. Erika Ruud, a senior from St. Charles, Illinois, is majoring in automotive technology and pursuing a minor in education. She hopes to work a few years in the automotive industry and then teach automotive technology in high school or college. Ruud, who along with other female students is restarting the Women in Automotive Technology club, a registered student organization, began as a theater major at DePaul University but was not happy. She opted for a career in the automotive industry and attended Elgin Community College before transferring to SIU Carbondale. She will graduate in December 2019. Students also see another segment within the automotive industry and the potential for job opportunities, Behrmann said. Students also gain experience with their own communication skill sets. Different automotive-related vendors and manufacturers will also be present. 1966 Chevy Nova Super Sport, a project started in 1985 with a $100 body. Students receive first-hand knowledge while working on the drag car, which competes locally in Benton and Harrisburg, Paducah, Kentucky, and Sikeston, Missouri. SAE Formula race car designed and built by students in the College of Engineering. An electric cart the students designed and built that features regenerative braking and lithium batteries. Automotive Technology students will develop, judge and present the “Best Integration and Use of Technology Award” at the 35th annual General Tire Street Machine Nationals, this Friday through Sunday, at the Du Quoin State Fairgrounds. The program will also have a “Hot Rod Hospital” available for participants who need to make repairs or borrow tools and equipment for quick adjustments to their vehicles.